The Colombian government must deal with its legacy issues if it is to secure lasting peace, a victim of Northern Ireland’s Troubles has said. During a visit to Belfast on Thursday, the president of Colombia hailed Northern Ireland as an inspiration that is driving him to secure peace in his own country. Juan Manuel Santos said he told fellow Colombians to “look to Belfast” when trying to show them the dividends a peaceful future can deliver. But Stephen Gault, who was seriously injured in the 1987 Enniskillen Remembrance Day bomb and whose father was killed in the atrocity, said the Northern Ireland’s peace was built on a “foundation of lies”. “Almost 20 years after the Good Friday Agreement brought peace to Northern Ireland, we still haven’t come to terms with our past,” he added. “Yes there is peace in Northern Ireland, but when you scratch the surface there are still many unresolved issues. “We still live in the shadow of paramilitary violence, and it has become clear that while there is justice for some parts of the community, others have been left behind. 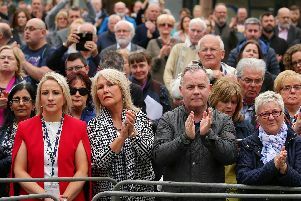 “There have been inquiries into certain matters, such as Bloody Sunday, but we have been told police are no longer looking into the Enniskillen bombing. “There should be no hierarchy of victims. These are matters which the Colombian government will be faced with. Colombia has been blighted by a bitter and bloody internal conflict for decades, as Northern Ireland was before the Good Friday Agreement paved the way for a more peaceful future. Mr Santos won the Nobel Peace Prize for his efforts to broker a peace deal with left-wing Farc (Revolutionary Armed Forces of Colombia) rebels. A number of politicians from Northern Ireland have contributed to initiatives to reach a settlement in Colombia. During his one-day visit to Belfast this week, Mr Santos was given a warm welcome at Stormont Castle by First Minister Arlene Foster and Deputy First Minister Martin McGuinness. Mr Santos said the efforts to achieve reconciliation once the violence stopped in Northern Ireland had impressed him. Although September’s peace deal was narrowly rejected by Colombia’s citizens in a referendum, the president has extended a ceasefire with the country’s largest rebel movement to allow more time to save the proposed accord. More than 220,000 people – mostly civilians – were killed during the 52-year conflict and more than eight million were driven from their homes.